Welcome to this photo tour of Excursions from Glasgow. 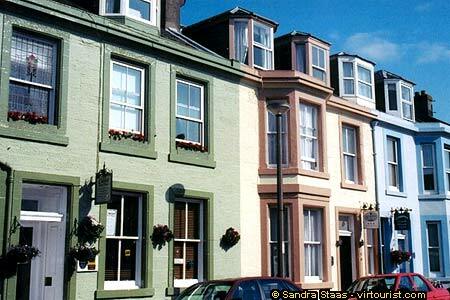 These colorful buildings attract the hordes of tourists who visit the popular seaside town of Ayr, located in the southwestern part of Scotland. Trains for Ayr leave from Glasgow's Central Station, and the journey takes about one hour. Nothing, however, can beat exploring by car, for you can stop anywhere you want as you meander your way along winding roads and discover hidden lochs and valleys. If you're not used to driving on the 'other side' of the road be prepared for adventure and seeking of the rear view mirror in strange locations! If you're worried about the weather, that's good. Be prepared. An umbrella will be your best pal and that scarf you have tucked away in your suitcase "just in case" might very well be a good companion. I'm Sandra Staas, your tour guide. Excursions from Glasgow are really smashing. You can be out of the city and "doon by the water" or somewhere completely different in no time. That's the beauty of living in a small country! Off we go to Ayr, Loch Lomond, Inverary, Oban, Isle of Seil, and Loch Awe.